Every year, the students in the EPL program are given the opportunity to address policy issues and gain real world experience during their EPL Proseminar Course (EDU 686). 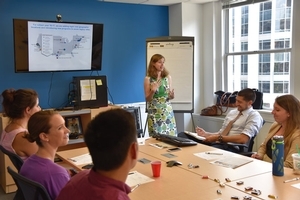 Working with education policy organizations in DC, students immerse themselves in research on a range of issues including teacher salaries and benefits, college prep, school choice, and teacher effectiveness. During the summer of 2018, the EPL students worked with the American Federation of Teachers, The College Board, District of Columbia Public Schools (DCPS), Institute for Educational Leadership, The Management Center, Office of the State Superintendent of Education (OSSE), National Council on Teacher Quality (NCTQ), and Teach Plus. Each organization engaged the students with a specific challenge they were facing, allowing the students to provide recommendations to help the organization solve it. The opportunities offered through the EPL Proseminar Course allows students to play a role in education policy and practice. By combining their classroom work with a practical experience, our students are able continue their emergence into leaders and policy makers. Not only was the experience meaningful for students, it also made a difference for each of the education organizations.